Every iOS device integrates Apple’s patented messaging service called iMessage. It an interesting feature embedded into the built-in Messages application. With the iOS 10 platform, a more promising iMessaging experience is offered to each and every user of iOS devices including the latest iPhone 7 Plus handset. Nevertheless, just like other apps and services, the iPhone 7 Plus iMessage and Messages app also succumb into some troubles. A rising number of complaints are now populating relevant forums and websites, in which owners of this new iPhone were dealing with various issues while using the stock Messages app, such as iMessage that is not working and unable to send or receive text or multimedia messages. While the occurrence of these messaging issues was random, they still can inflict major troubles especially to people whose daily routines or business operations rely much on their iPhone’s messaging service. What could have possibly triggered messaging issues to arise even with the iPhone’s robust technology? How can a user deal with these problems on their end? These questions are basically what this post is trying to address. If you happen to come across this page while searching for some help in dealing with a messaging problem on your iPhone 7 Plus, then I encourage you to read on so as to get potential help. As to our readers who have other issues, visit our iPhone 7 Plus troubleshooting page for we have already addressed a lot of issues with this device. There could already be existing solutions to your problems so try to find issues that are similar with yours but if you need further assistance, then feel free to contact us by completing our iPhone issues questionnaire. What factors can likely affect the iPhone’s messaging function? In most cases, the main issue is triggered by minor software glitches, particularly with the iPhone’s stock messaging application. Just like any other apps, the Messages app on iOS devices can also succumb into minor troubles at random instances. There are times when the app becomes dysfunctional or doesn’t work as it should due to some files that get corrupted. As a result, users are unable to send or receive messages. Symptoms can manifest on either the SMS or MMS functions on the iPhone. In worst, case scenarios both the SMS and MMS features are not working at all. Given that the main issue lies within the iPhone system or software-related, end-users can still do something on their end to fix it. Fortunately, various workarounds are offered both by Apple Support and other iPhone experts to help users troubleshoot different issues with the iOS messaging application including iMessage. These methods are elaborated below this page, so all you need is scroll down a bit and spare a little of your time and give each of these troubleshooting procedures a try to fix an issue you have with your iPhone 7 Plus messaging app. To give you a hint on which things to work on, consider the following factors as possible causes of the messaging problem to occur on your iPhone 7 Plus. Account issues – inactive account status is one of the most common reasons as to why several owners of mobile devices were unable to utilize outgoing services on their respective devices. Some carriers typically impose soft disconnection on delinquent accounts or accounts with past-dues or unpaid bills. During this state, outgoing services for that account are temporarily deactivated. These would include mobile internet, outgoing calls and texts. Usually, users are notified through automated messages or voice prompts (when attempting to make calls) telling that outgoing services are temporarily restricted until certain account issue has been settled. In this case, you will need to contact your carrier for more details and recommendations for your outgoing services to resume. Network connectivity issues – network-related problems can also disrupt messaging functions on your iPhone. For example, you cannot send or receive messages because your device is getting no signal, no service, or other network errors. An active network is required for you to send standard messages over cellular data and Wi-Fi connection for iMessage. You are most likely to have troubles in sending receiving messages if your network is intermittent or keeps cutting off. Outages affecting Apple’s messaging system can also cause you the same trouble in sending or receiving standard SMS and MMS as well as iMessages. Faulty SIM card – SIM card issues like damage, loose or incorrect SIM card installation are also among the factors to consider when dealing with messaging problems on your iPhone. Usually, you will be prompted with a relevant error message or code like Invalid SIM card, SIM card not detected, or other error prompts. Re-installing the SIM card can be a potential solution in these cases. The process is basically carried out by removing the SIM card from the device for a few seconds, and re-inserting it afterwards. This is done to ensure that both the SIM card and the SIM tray are properly secured in place. Software updates – while device manufacturers did their best to ensure that every software update they are release are free from any sort of bugs, problems during the actual implementation are inevitable. This is likely because the devices they’ve used for testing have dissimilar configurations with those from the end-users. For example, a user may have added new contents that are actually not compatible with the new platform or software update. Or the original system configuration has been modified. This is one of the main reasons as to why post-update issues arise. Hardware problems – this might sound a little bizarre especially in new devices but it’s possible to happen. One day, you might have accidentally dropped or exposed your new iPhone to some sorts of liquid. As a result, some components are damaged and being unable to send or receive messages on your device is just one of the associated symptoms. Unfortunately, device issues that are hardware-related would already require a technician’s aide in order to get fixed. How to fix messaging problems on your iPhone 7 Plus? Solutions can vary depending on the underlying cause. One thing that can help you fix the problem quickly is by determining which has caused the problem to happen in the first place. This denotes a need for you to look back on what has happened before the onset of the problem or before the first symptom begins to show. However, if you could not possibly point out the root cause of the problem, then you can just try each of the applicable solutions until the problem is finally fixed. This can be time-consuming but necessary. Before you start doing any of the suggested troubleshooting methods and workarounds, it is highly recommended to check on a few things first. We have previously enumerated the possible factors that can cause messaging problems on your iPhone. Your chance of finding a quick solution is higher if you will start working on these factors beforehand. So basing on that list, here are the things that you need to check first. Step 1. Check your account status. Should the problem be caused by a soft disconnect or temporary deactivation of outgoing services due to account-related issues, troubleshooting won’t be necessary. All you have to do is contact your carrier, verify your account status and if necessary, settle any problem like billing issues perhaps, and the problem shall be fixed. Accounts that are placed in soft disconnect are restricted from using outgoing services like making calls or sending messages over cellular data. Another thing to check and verify with your carrier that might have caused messaging issues on your iPhone 7 Plus is on network outages. Network carriers would usually make prior announcements for scheduled maintenance operations causing service interruptions. However, network outages can also happen unexpectedly and the first people to know of these happen are your service provider’s support team. Usually, all you have to do is wait until the network outage is over and your services shall resume. Just ask for the estimated timeframe as to when the outage is over so you’ll have an idea as to when to retry using the service. Step 2. 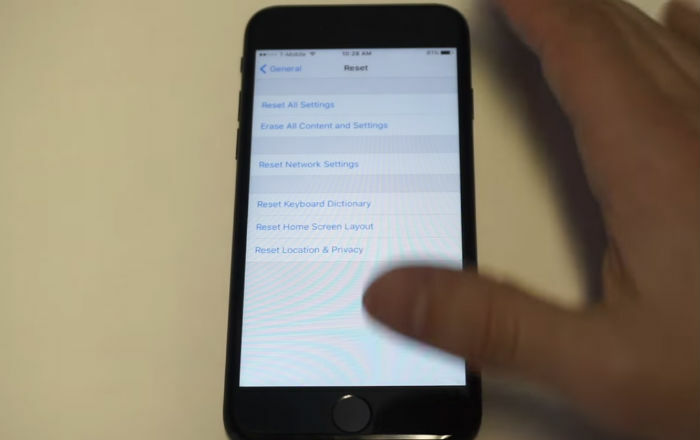 Check and verify network settings on your iPhone. Settings you need to verify and ensure properly configured when you cannot send or receive messages on your iPhone are basically, Wi-Fi and Cellular Data options. For iMessage service to work, you need to enable Wi-Fi on your device. For standard messaging services via Cellular Network, you will need to enable Cellular Data. To verify if Wi-Fi is enabled or turned on, go to Settings-> Wi-Fi. Make sure the Wi-Fi switch is turned on. If not, toggle the switch to turn Wi-Fi on and enable wireless services on your iPhone. Alternatively, you can swipe up from the bottom of your Home screen and open the Control Center, and then tap the Wi-Fi icon to enable the feature. To verify Cellular data is enabled on your iPhone 7 Plus, go to Settings-> Cellular-> Cellular Data or Mobile Data. Make sure it is turned on or enabled. If you are having trouble sending and receiving messages on your iPhone 7 Plus while travelling internationally, you may need to activate Data Roaming feature on your device. This feature is listed among other Cellular Data options on your iPhone. To enable data roaming option, go to Settings-> Cellular-> Cellular Data Options-> Data Roaming. Toggle the switch next to Data Roaming to enable or activate the feature. Step 3. Verify MMS settings and blocked list. One of the options that must be enabled in order for you to send and receive MMS messages through your iPhone’s stock Messages app is the MMS messaging option. To access this option, go to Settings-> Messages-> MMS messaging. This option has to be enabled or turned on. If this option is not available under Messages settings, contact your carrier to verify if the service is activated on your account. You may need to request your carrier to activate MMS message service to use the feature on your device. Meanwhile, if you cannot send a message to a certain contact or specific phone number, there is a higher chance that the number or contact is included in your blocked list. To rule out this possibility, head over to your iPhone Settings-> Messages-> Blocked. On the list that shows up, review the contact details or phone numbers. If necessary, remove the number or contact from the blocked list. To unblock a phone number or contact on your iPhone 7 Plus, head over to Settings-> Messages-> Blocked, then tap the Edit menu located on the upper-right corner of the screen, tap the minus (-) icon and then tap Unblock. Retry sending a message to that recipient or phone number after removing it from the blocked list. In the case where only one of person is unable to get your messages, then the problem is most likely not on your end. Have that person check his/her blocked list and if necessary, remove your phone number or email address from the list. Step 4. Check date and time settings on your iPhone. To rectify this glitch, you’ll just have to configure the date and time correctly or set automatic date and time settings on your iPhone instead. To do so, head over to Settings-> General-> Date & Time, and then tap the option to Set Automatically. Using this option will automatically set the date and time on your device based on your time zone. Step 5. Check your iPhone’s memory status. Although this may sound odd considering that your iPhone is new and that it is packed with a notably higher storage capacity, it is also among the possible factors to consider especially if you’ve already installed a number of new apps and contents on your iPhone and that you are having trouble receiving complex messages or MMS. Typically in cases like this, you’ll get to see a warning prompt saying that your device memory is running low and that you need to free up some space for your iPhone to allocate new files, including messages. Removing of unnecessary contents from your device can help free up space. To check memory status on your iPhone 7 Plus, go to Settings-> General-> Storage & iCloud Usage. Carefully assess details including the amount of storage used and available space. Make sure the available space is enough to allocate additional files on your device. Messages (SMS and MMS) are among other files that utilizes some space of your iPhone’s internal memory. The larger the file size of a message, the more space it would require to be properly allocated. The following methods are comprised of generic solutions and recommended procedures for iPhone users to use when dealing with messaging issues on their device. You can give all these methods a try especially if you do not know exactly the cause of the problem. Try to create a test message after completing each method to see if the problem has already been fixed. Otherwise, continue to the next application solution. Step 1. Restart the messaging app. Random issues happen to any apps on any device including the iPhone 7 Plus Messages app. If the problem suddenly occurs without making any changes to your iPhone in the first place, then it’s probably just a random app issue that can be fixed by restarting the app. To do so, quit or close the Messages app and then re-open it. Step 2. Reboot (soft reset) your iPhone 7 Plus. If restarting the Messages app wasn’t be able to fix the glitch, the next possible solution you can try on is a soft reset. The term is synonymous to a reboot or restart, or simply turning off and then back on. To soft reset your iPhone 7 Plus, press and hold the Sleep/Wake button for a few seconds until the red slider shows up. Drag the slider to power off the iPhone completely. After 30 seconds, press and hold the Sleep/Wake button again until the Apple logo appears. Your iPhone should then reboot. After the reboot, try to open the Messages app and then create a test message to see if you can now send and receive it. Step 3. Verify and configure iMessage on your iPhone 7 Plus. If you are having problem sending or receiving messages using iMessage on your iPhone, try to check if iMessage options properly configured. To do so, head over to Settings-> Messages-> Send & Receive. You will then see a list of phone numbers and email addresses that are previously configured to send and receive iMessages on your device. Again, in order to send and receive iMessages on your device, you will need to add your phone number in to the Send & Receive section. If you see an empty list, it means that you haven’t set any phone numbers or email addresses yet and so that what you should do. Once you get to the Send & Receive menu, go the “Start New Conversation” section then check the box next to your current phone number. After doing so, tap on your phone number to activate iMessage for your number. This is likely the case if you’ve changed your number. Step 4. Delete existing conversation. If you are having problem sending or replying to a message in an existing conversation, then try to delete the conversation and create a new one instead. This usually fixes the problem. Swipe left over the conversation you are having problem with. Tap the option to Delete. After the restart, open the Messages app again. Tap the Create New Message icon to create a new thread or conversation to send to the same recipient or contact. Tap the Send icon once your message is finished. If your message is not delivered and that you are seeing a red exclamation mark (! ), try to tap the red exclamation mark and then tap Try Again. If that doesn’t work or the message remains not delivered, tap the red exclamation mark again and tap Send as Text Message. Doing so will send the message as standard text over cellular data network. Step 5. Reset Network Settings. Some problems with sending and receiving messages occur after making changes to your iPhone settings, particularly with the network options. You may have set an option that is not supposed to be used or activated. To rule this thing out from the possible culprits, you can try to revert the changes you’ve made to your iPhone’s network settings and then see what happens. If you are not sure which settings to re-configure, then resetting network settings might be the best option for you to try on. The process basically resets network settings on your device, which means that your current network configurations including APN and VPN settings and Wi-Fi credentials or password will be erased. To reset network settings on your iPhone, go to Settings-> General-> Reset-> select the option to Reset Network Settings. After the network settings reset, reboot your iPhone , open the Messages app and see if you can now send and receive messages without any issue. Step 6. Update to the latest iOS version. Your iPhone 7 Plus originally comes with iOS version 10. Apple has released a series of minor updates to bring in new features, system enhancement as well as bug fixes. If you haven’t installed any iOS update since you get your device, then you might as well consider doing so now. If the messaging problem you are dealing with right now is triggered by a glitch or bug affecting the Messages app, then it’s likely to get fixed by a software update containing bug fixes. To check for any available iOS update for your device, go to Settings-> General-> Software Update. If an update is available, backup your iPhone and then proceed with iOS download and installation. Re-install SIM card – If you are seeing messages associated with SIM card errors, try to remove and then re-insert the SIM card on your iPhone (if possible). Before you do so, be sure to power off your device completely. Once powered off, use a small paper clip or SIM eject tool to pop the SIM tray out. Carefully remove the SIM card and then place it back to its original position. Also try to check the SIM card for any signs of damages like scratches or dirt. If the SIM card is good, place it back inside the SIM card tray, and secure the tray. Turn your iPhone back on and see if you can now send and receive messages without any errors. Use other messaging apps – Using other messaging app than the stock Messages app on your iPhone will help you determine whether the problem is isolated to the built-in application or not. This can also be considered a temporary solution should this be a post-update issue you are currently dealing with. Considering that you’ve done everything or tried all possible solutions and workarounds in an attempt to fix the iPhone 7 Plus messaging problem on your end but to no avail, your next option would be on problem escalation. This denotes contacting Apple Support to escalate the actual problem on your iPhone and then request further assistance and recommendations.